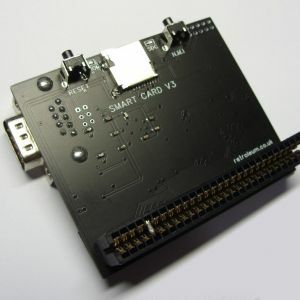 The SMART Card is a SD-card game loader / kempston compatible joystick interface aimed at Spectrum 48K* users who want a simple, plug and play method of loading games quickly. Upon power up, you are presented with a list of games on your SD Card from which you can select using the joystick or keys. The .sna and .tap files found on www.worldofspectrum.org and other websites are supported. The SMART Card also has extra features such as its diagnostic ROM which can be used to identify bad RAM chips etc. There's also reset / NMI buttons so snapshots of games can be saved, pokes entered etc. *The V2 SMART Card fits - and works with - all UK Spectrum models with 48K or greater, but please note the software currently only supports 16K/48K games. I have some suitable micro SD Cards here if required. I make and list these almost every week (as time allows) but they do tend to sell quickly - if out of stock, drop me a line and I'll email you when I have more listed. Sorry, I cannot reserve them.